How do public works work? GIZ has a crisp note summarizing key impacts. 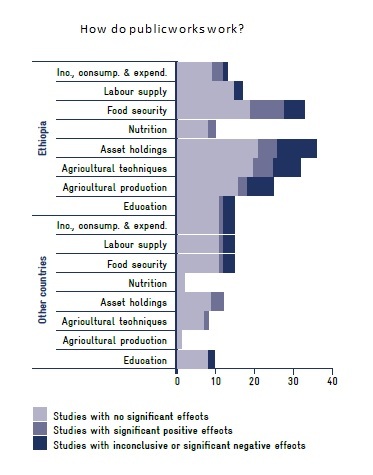 While most of evidence from Africa and MENA revolves around Ethiopia’s PSNP, the examined 28 rigorous studies show effects across a range of dimensions (see figure above), although these are often statistically insignificant. Also, there is a sense that public works are not being assessed against their full potential – for example, there are wide knowledge gaps around how wages, assets and skills generated as part of the program persist beyond its duration. Speaking of those interventions, the CFI magazine features how mobile childcare provisions were incorporated in public works programs in Burkina Faso (h/t Rebekka Grun). From conditions on work to those on education. A quantitative paper by Bergstrom and Dodds argues that, in Mexico, conditional cash transfers (CCT) can better target low-consumption households relative to an unconditional cash transfer (UCT) (h/t Nithin Umapathi). This is because sending a child to school can result in a discrete loss of child income, so that schooling may be negatively correlated with household consumption. Thus, schooling decisions may act as a useful “tag” for cash transfers. In particular, the authors calculate the extent to which the households sending their children to school value receiving an extra dollar relative to the households not sending their children to school. Based on the estimation of such elasticities, they show that 55% of the Prospera budget should be allocated to a CCT over a UCT based on the targeting beneﬁt alone. Two papers on a different type of CCT in Mexico – that is, payments for not cutting trees. The intervention, named Pago por Servicios Ambientales (PSA) has a budget of $60M and claimed over 2 million hectares of forests since 2014. In one paper, Alix-Garcia et al argue that adding a simple referendum-style question on “willingness-to-accept” payments in beneficiary surveys could reduce program costs significantly relative to current payment schedules. In a second paper, Alix-Garcia and colleagues evaluate the impacts of PSA over 2011–14. The analysis finds that treated communities increased land management, such as patrolling for illegal conversion or combatting soil erosion, by 48% compared to controls. Also, the program reduced the loss of tree cover in areas at high risk of deforestation by 29%, with effects being larger for those that have been in the program the longest. One of the studies from last year recently released on CaLP’s platform furthers the discussion on the conditionality theme. In particular, a nonexperimental evaluation by de Hoop et al on the ‘Min Ila’ program (including midterm and endline reports) examines such unconditional cash transfer scheme for displaced Syrian children. The program covers for a portion of the indirect costs of schooling (e.g., snacks, transportation, and appropriate clothing and shoes). The intervention improved children’s food consumption and their physical health, lowered child work, improved subjective well-being, and increased school attendance. However, both recipients and school administrators seems to have misperceived the program as being conditional. The other released studies include a short, qualitative study by Escot on household economy approach and PMT in Mali, and a paper by Kerkvliet applying the ‘bureaucratic politics’ framework to humanitarian coordination in Ukraine and Lebanon. Moving to Asia, an IFPRI discussion paper by Ahmed and Tauseef shows that social assistance play a key role in poverty reduction in rural Bangladesh. Specifically, they estimate significant declines in persistent and transitory poverty when a household receives a monthly safety net transfer of at least 1,500 taka per month. More on Asia: a WIDER working paper by Dang and Lanjouw finds that in India, 40–60% of the population transitions between consumption classes; yet the majority of those who escape poverty remain vulnerable. On China, Li et al describe the major trends in the country’s income inequality over the past 40 years and explain them as the outcome of four intertwined stories. One of these relates to how government efforts were directed to moderate inequality through social protection (see p.16). Turning to wider issues around social protection, by when would universal social protection (USP) be achieved? With business as usual, it will take a while. According to my back of the envelop calculations, USP would be realized, on average, by 2084 – and in fragile states, well, by 2259. In terms of social protection learning materials, check out the January edition of the TRANSFORM newsletter, an interagency initiative on learning and practice-sharing on national social protection systems (h/t Luca Pellerano). 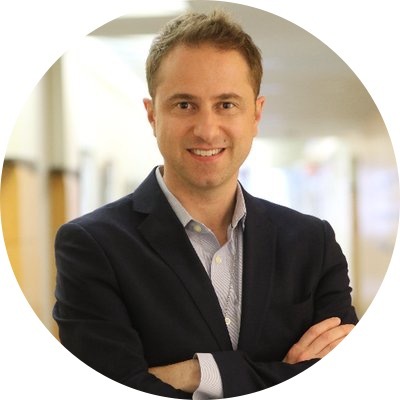 Let’s look at labor-related matters: a VoxDev interview with Attanasio explores the effectiveness of activation measures. In particular, he discusses the Jóvenes en Acción program in Colombia, the effects of which have persisted over time due to its alignment with firm requirements. Based on evidence from Zambia, Resnik finds that tax compliance is higher among those workers operating in markets with better services. In other words, “… even among a relatively poor segment of the population, tax revenue can be mobilized if the benefits of those taxes are directly experienced”. Any news on financial inclusion? Duvendack and Mader have a systematic review of financial inclusion in low- and middle-income. Examining 11 studies, they find that impacts of financial services on poverty are mixed, effects on women empowerment are generally positive, while health outcomes and behaviours display limited or no changes. Savings seem to foster small but steady impacts on poverty. Finally, some big-picture thinking: in a thought-provoking Brookings post, Fengler asks whether higher mortality can be a sign of progress – that is, he identifies a global tipping point in 2007 when, for the first time ever, the number of senior people passing away outnumbered that of young people. In another interesting blog in the same collection, Kharas brings back the ‘relative income hypothesis’ (RIH). He notes that “… sometimes important trends are not noticed because they happen slowly and steadily rather than in a sudden rush the proverbial boiling frog fable. So it is with the middle class. Its rise has been slowly accelerating to this point. Now, it is of sufficient scale to be a driver of the global economy”. Yet surveys show a growing degree of unhappiness among the middle class, and part of the explanation could be the RIH, i.e., people also seem to care deeply about how they do relative to others, not just in absolute terms. Bonus: Brian Levy reflects on the limits of ‘working with the grains’.